I have spent a reasonable amount of this year travelling for work. Every business traveller has their horror stories or their personal list of frustrations when ‘on the road’. But I think there’s one unifying annoyance: almost everybody who travels on behalf of somebody else hates compiling their expenses upon their return. Unless, of course, you are in the fortunate position of having a company that provides a corporate credit card that they settle via some hands-off automated means or have a corporate expense system that works with some kind of smartphone app that allows you to scan as you go. I have neither. It’s another system in need of serious attention and will be the subject of another post no doubt. If you do have to complete some kind of expense system it is certain that you will spend a disproportionate amount of your precious time looking at tiny bits of paper trying to remember where they are from, why you needed to spend that much money and who was with you. At least, I do. Never mind trying to determine what to do if one item is not a permitted expense. Oh help me now. And this is an aspect of our daily life that’s ready for a wholesale overhaul. Please tell me somebody, somewhere is working on making them customer-friendly because the receipt industry needs a healthy does of usability training. Wow, there’s a receipt industry. Who knew? 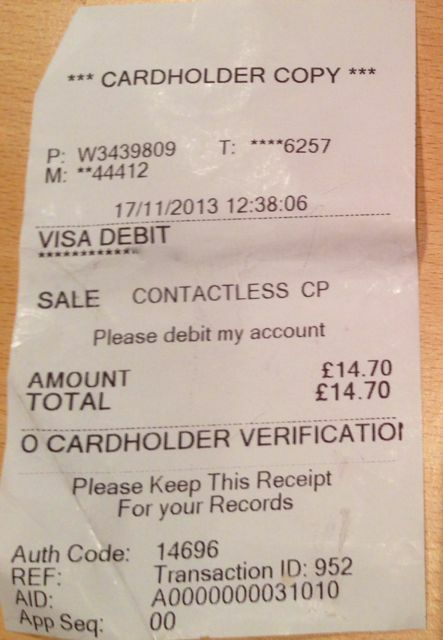 Now, many receipts are passable as they contain some useful information. I bought 8 items in a supermarket earlier today. The receipt is 30cm long: that’s as long as the rulers they used to make you use at school. Seriously, try folding that and keeping it in your wallet. And all for 8 items. I guess it does list my carrots, amongst other things, but over half the receipt is full of information that’s either redundant or repeated (the total value is shown 4 times); it contains two phone numbers (one to call to tell them about my experience, perhaps I’ll mention the receipt); the date and time is shown twice – never in an obvious place like at the top – and there are strings of meaningless numbers. Why, pray tell, do I care what an AID is or what the 19 digit cryptogram is. Shouldn’t something called a cryptogram really be secret? It might mean something to somebody on the other end but not to me as the person walking out of the shop. I love the fact it contains the phrase ‘please retain this copy for your records’. Does anybody do that these days? Do I need to know the App Seq is 00? However, the paper on the left is the subject of this post and the plea to people who make tills and their associated receipts. Please make them useful or don’t bother wasting the paper. This receipt was handed to me in a burrito shop. The burrito was delicious and much was made of the freshness of the produce. I guess they spent so much time looking for a fresh avocado that nobody bothered to program printer with even the name of the fabulous burrito place. Really, I could tell you the name of the store but only because I checked on on Foursquare (there was no special and I am not mayor). If I’d left my wallet full of 30cm supermarket receipts I wouldn’t be able to pull this one from my pocket and call up the shop to ask if they’d found it because they don’t bother to print their name or number. 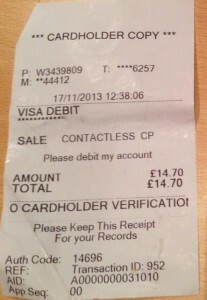 I do know it was £14.40 (I bought lunch for two) because they tell me – twice. I also know it was a contactless CP. I hope it was a ‘CP’ because I have no idea what that means. I can’t complain to them if it wasn’t because they didn’t bother to put any contact information on it. Did I mention that? I know the transaction ID was 952 which doesn’t reassure me about anything, except to suggest that they might have only served 952 people in their store. Which doesn’t seem very many. There’s an AID on this one too. What, somebody tell me, is an AID? I also know the value of P, T and M. Given I gave up any pretence on mathematics when I was 16 these are meaningless to me. Really, how hard is it to either give me something useful or not bother? Remind me what I ate and where you are, tell me how much I spent on which card. I don’t need much else. If you want to do something helpful why not tell me the nutritional values of the food I bought? If you want to offer me a reward to comeback or a helpful customer care line then, I guess, pop that on there. But please – most importantly of all – I do not need to be reminded to keep this Worthless Piece Of Paper For My Records (why the capitalisation?). I could go on about the really helpful receipts I get from Kabbee or the great service at an Apple Store where they email you the receipt and do away with paper completely but I don’t have time, I have some carrots on the stove that I ought to go and eat.